A burnt-out car, situated outside the gates of Kernan Cemetery, is being removed by council staff today (Monday), it was confirmed. There has been criticism since Saturday about the car’s proximity to the cemetery, with calls to have it removed as quickly as possible. A spokesperson for Armagh City, Banbridge and Craigavon Borough Council said staff from the technical services department were on their way to remove it. 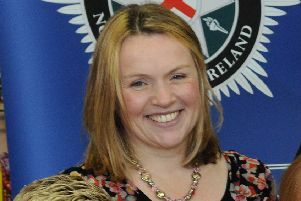 She added that the PSNI had received no report regarding the car, which appeared to have crashed into a lamppost.